In the way that one thing can lead to another, Kristin was inspired by the giveaway of Elizabeth’s hand dyed fabrics to offer up something for another giveaway on the Block Lotto. In January 2010 we made 280 Tic-Tac-Toe Blocks. Kristin won 40 blocks and is offering them for the giveaway. Here’s how you can earn chances to win. Earn ONE chance by leaving a comment telling us what you would do with these blocks if you won. This month, I am asking you to Blog About Color and add the link to your blog post. Earn TWO chances by entering blocks in this month’s Block Lotto. The Giveaway is open until Friday, February 14 at midnight (in Santa Fe–Mountain Time zone). I wasn’t part of block lotto when these were the block of the month. I like how she grouped all the colors together! I think I like what Lois did with her blocks but I may sew them together like Krista did second on the list. Pretty cute!! I didn’t realize that the Rafflecoptor defaulted to starting tomorrow. I’ve edit it so you can use it to get your chances now. I plan on making a block. Can I edit the Rafflecopter once I submit my block or should I wait? Ooh. I would love to win these. I re -started my quilting in 1997 with a baby quilt class and the blocks were criss-crossed with narrow strips in a very liberated way. I’d been away from quilting for 45+ years and it was a real departure from the hand-pieced and hand-quilted grandmother’s garden I’d learned back then. So now I’m doing all kinds of crazy stuff and would love to play with these blocks. I immediately saw a rainbow quilt when I saw these blocks. I would keep the sashing too. I recently found your blog and I’m starting to get my bearings and understand what’s happening. What a great idea of a block lotto. I’m glad you found us, Joy. If you have any questions, be sure to ask. And if/when you’re ready to play along, let me know. I think it would make a nice signature quilt! The signatures could be on either the stripes or the background. I would probably make some 3 inch (finished) x and o blocks and add them as cornerstones in a 3 inch sashing. 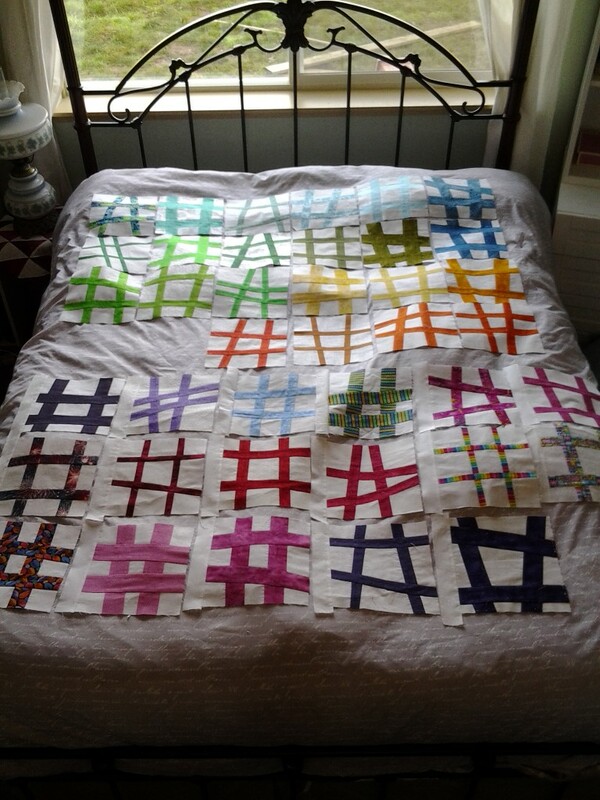 Or I would make a rwo quilt with smaller x and o blocks. So…somehow I would incorporate some x and o blocks and I would probably donate it to some cause. Cathy, I love your idea. I can’t believe no one tried that when we made the blocks. I think these would make a wonderful quilt for a young child, in the 10-15 yr old age. They are so cheerful and have such movement. I would add white blocks between and a striped border (color/white). This would be a wonderful bed-quilt for my youngest daughter. Such a nice variety of blocks and colors! If I am fortunate to win these blocks, I will add sashing and make a quilt for my granddaughter. I would love to win them. The sashing looks good, and I would make one or more quilts for newly diagnosed diabetic children. Good luck Hilda. You would definitely have enough for a couple bright, happy quilts. I would make a baby quilt for our chiropractors, a husband & wife team. This is their first child together. If I don’t win, I think I will make one similar to Andra’s above. I always forget about looking at old/past sources. I am always looking for NEW ideas. I think I would continue with the white sashing that Kristin started with. They could look like they’re floating that way. The size would be good for a couch quilt. These would make 2 great baby quilts! Cute and colorful!!!! Now I’m back home and getting ready to quilt again. The actual quilting is my favorite part of it all so getting these blocks would be wonderful to practice with and to make baby quilts for the three new little ones in my life! So my fingers are crossed. Thank you for putting my name in the hat for this special drawing.